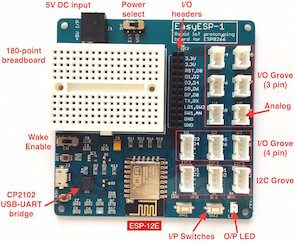 A very cool-looking weather station using the ESP8266 WiFi module chip and a high resolution 7.4″ a-Si TFT active matrix Electronic Paper Display (EPD) module from Pervasive Displays shared by andrei7c4. The weather data are gathered from OpenWeatherMap service. Most of the time the device stays in deep sleep mode consuming only 18 µA. While updating the weather power consumption varies from 80 to 150 mA. Update operation takes a few seconds, depending on WiFi router, DHCP server and internet connection speed. With 30 minute update interval 3000 mAh battery should last for a few months on one charge.